So, a few weeks ago, The Inspired Room was voted in the top five of the Best Home Blogs in a contest put on by Lamps Plus! I wasn’t aware my blog was even entered or in the running, so I was quite surprised but thrilled to find out I was among the top five winners! HOORAY! And to make winning a little sweeter, there was a $500 gift card prize for getting voted into the top five best blogs! DOUBLE YAY! So, big thanks to those of you who voted for me even without me bribing you, haha, you all ROCK. I’m SO GRATEFUL! One of the things I was able to get with my winning gift card was this awesome little side table bookshelf for my family room! I love the style AND function of this piece — and that is a WIN WIN in decorating. The minute I saw it, I knew it had several design elements that intrigued me. Not only did it have useful shelves that could be filled with stacks of books, magazines, or accessories and cozy blankets, but it has unique design detail from every angle. And, I loved the fresh look of the more natural wood as it adds interest to contrast and complement other elements in the space. As my home is evolving in a more clear design direction, I am starting to feel much more intentional in what I like and what I buy for my home. It is so helpful to have the basic “shell” of my home done now, with the kitchen, paint and flooring basically complete in the main rooms of the house. Yes, I will show you my painted cabinets soon!! I no longer feel quite so haphazard and crazy-eyed about what I need or want to do with this house. Obviously I love MANY styles (remember my post on Finding my style with Pinterest? ), and always will, but I only have one house. And it helps to have a clearer picture of what MY house looks like, even if it is eclectic! Because of that design foundation, it is getting easier to spot what I actually need (or don’t need!) to finish a room. I’m LOVING being able to update or take away things that I feel pull the style or color palette in a random direction (now that I am SURE how the room is coming together) and add in things that both finish the space and add to the complexity and warmth that I enjoy in my home. It is also fun to finally be able to be more bold and confident in my choices, knowing they will actually make the right statement for the space I have, instead of looking like I was trying too hard to force something I liked or felt I needed to use, but it didn’t really fit. You know what I mean? I’m sure I’ll still have many moments of indecision and confusion (haha) but it is great to have less decisions to make! Sometimes it just takes time to get to that point of being comfortable enough with the direction you are going and to be able to know what works for you and what doesn’t. I will be working on adding layers of natural textures (interesting woods, mixed metals and pretty textiles while balancing things out with a little shine through pretty glass items). That is the kind of decorating I really get inspired by. I enjoy focusing in on how unique items can work together to create a pretty composition. And of course, the goal is keeping my home comfortable and authentic to our family, not just striving to make it pretty. 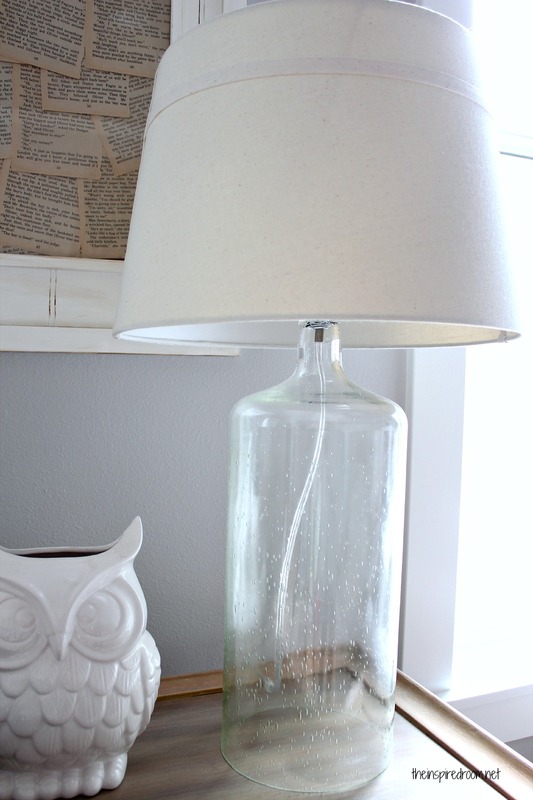 This pretty seeded glass bottle lamp and lampshade was a happy find from Target! I adore the see through greenish glass and the additional texture and shine in contrast to the wood pieces. It is so fun to be adding new layers of texture and interesting design elements to my family room, making it a very inviting and inspiring space for our family to be! I have more ideas for this room, I already LOVE spending time here. I’ll show you more sides of the room soon, as well as talk more about paint and color palettes in my home. Do you feel comfortable and confident in decorating your home and what your current style is, or do you still feel like you are trying to narrow down a direction to go? Decorating a home and finding your style is definitely a process! Congrats, Melissa! The table is a great functional piece. I love how the top looks like a tray and the legs look like the Christian symbol. Its great that you are to the point where your design goal is falling into place. I’m still in that haphazard mode. Thanks for the encouragment of keeping it intentional. I’d love for you to tell us more about the book page picture hanging above the table. Love it! love the table- what a great finish and shape! First of all Congrats on being recognized for you lovely blog… and I love the table that you got with your winnings! Hi Cathy! Yes!! :-) I guess I should post about that project! I haven’t even seen the whole room and I already want to snuggle up on the couch with a throw, hot chocolate, and a magazine. What a beautiful space for your family to enjoy! I keep checking back for a glimpse at that remodel :) Can’t wait! Thanks, Jessica, I can’t wait to talk more about the kitchen and show those painted cabinets finally!! :-) very soooooon…. Congratulations! How cool is it that you didn’t even know you were in the running for that contest? I know what you mean by getting the shell of your house together. I’m almost there! I know I’ll go back room to room to actually decorate and accessorize those spaces. Seconding the request for a post about the DIY Book Page Art!! Such a comfortable, stylish room. I’m in the same process as you – “haphazard and crazy eyed” – exactly! Hoping to move out of that soon! Congratulations on winning! The prizes look fantastic with your new floors! I know what you mean about developing a style over time. I would say I am “modern cottage” now but I certainly didn’t start out with that in mind. When we moved into this house I probably would have said I was going for a more traditional look. But what I have now developed around me and grew out of the choices I made over the years. I think your style is not so much a decision you make in one day but a true pattern that emerges as you mature and allow yourself to really “sink into” your surroundings. It’s a reflection of who you are. Can’t wait to see the kitchen! Congratulations! Well deserved. 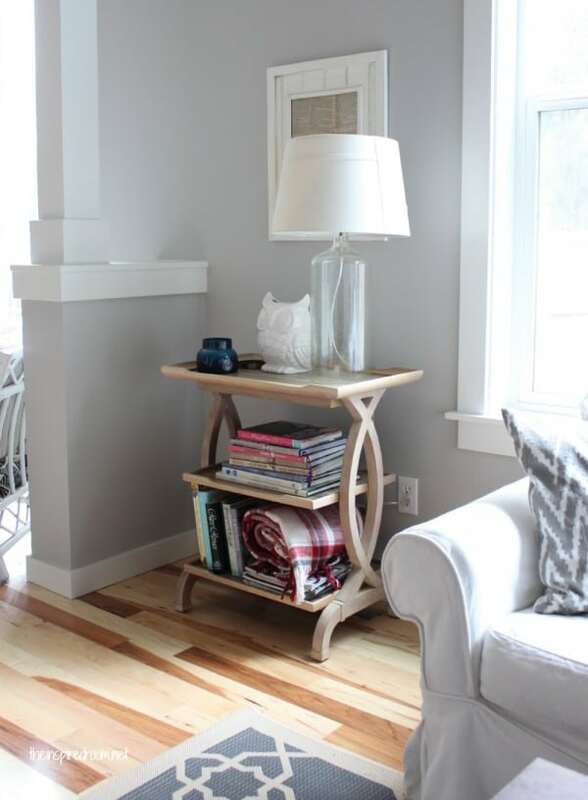 I love what you have done with this room and especially the side table, I am very OCD so I love the organized look. I have a authentic on the beach California Beach Cottage and am fortunate to be single so I can decorate it as I see fit, which is a beauitful blend of family antiques,shabby chic and a bit of Beach Cottage touches. Yup, “haphazard and crazy-eyed”!! Excellent words that so describe what goes on in my little house. A years long & strong desire to have a finished foundation in our cottage (and how in the heck are the two of us going to get all this work done) kept me tossing and turning until the wee hours. I’d love to snap my fingers and voila! Oh, and have an unlimited budget, lol! Congratulations! You deserve it! The family room looks beautiful! Congratulations! I love the table and the lamp. I looked at that lamp at Target and really wanted it, but decided I don’t need it right now. I also love the book page wall art. What book did you use, a favorite? The Bible? Please do post a tutorial on it. Also want to mention that I used Tobacco Leaf paint color in my foyer, living and dining room and love it. I’m actually not finished painting yet but it’s such a great neutral I could use it all over the house. Thanks for listing your paint colors. I was curious about this DIY as well. Would love to see a post about it! I definitely can relate to feeling a need to narrow down my decorating style. Since I am fairly new at decorating (just recently moved into our first home), it’s been a challenge (that I enjoy) to figure out exactly how to decorate. It’s been even more difficult being in an apartment where some decorating liberties are limited. I couldn’t agree with you more that it is a process, but I love the process! Congrats to you, wow, $500.00 to spend! 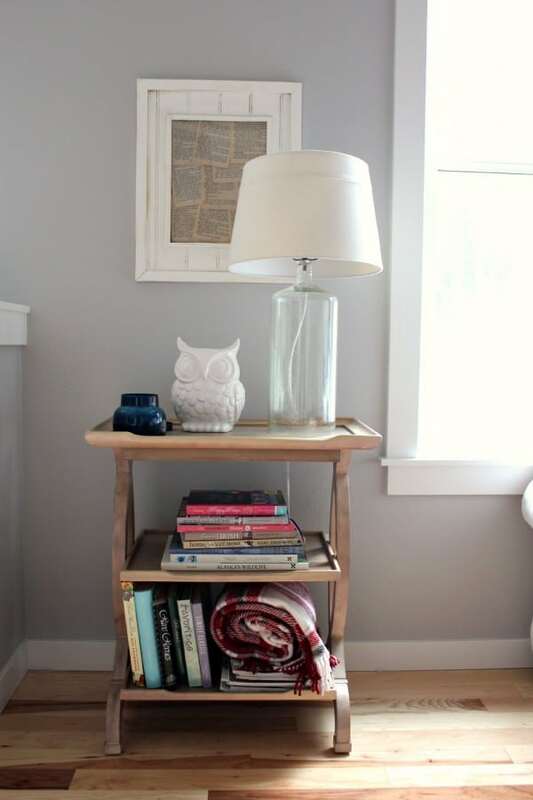 I love your table/bookcase and the framed pages you have there! My style is eclectic too but I still have a ways to go in getting it there, I love mixing styles that go together. 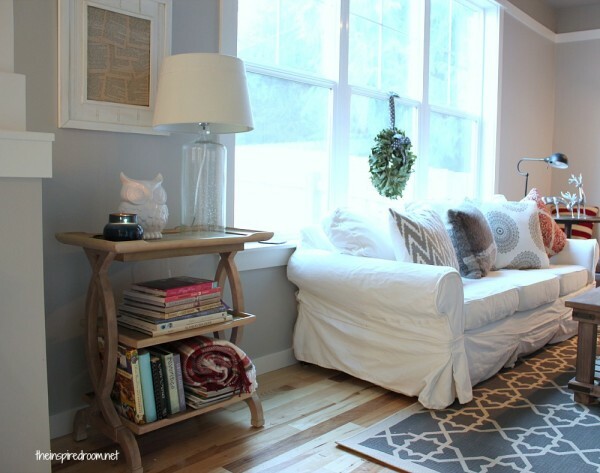 Is your sofa from ikea or pottery barn? Congratulations! I love the mix of styles in your home. That is actually my style as well. I feel like I’m eclectic Transitional. I’m working more on the eclectic part at the moment! I love the soothing colors in your room. And I really love your table! Where did you get it? I just came across your blog through the wonders of Pinterest and fell in love with that bookshelf! I’ve been searching all over Lamps Plus and can’t seem to find it. Do you happen to remember what it was called?